Share the post "Multiple Fibroids and Uterine Artery Embolization"
Have multiple fibroids and wondering if UAE can treat them? Learn more about how UAE can help you get on the road to better health. Can Uterine Artery Embolization treat multiple fibroids? Uterine Artery Embolization (a.k.a. UAE, Uterine Fibroid Embolization and UFE) is a global treatment of the uterus. For this reason, it is capable of treating all fibroids present, regardless of where they are located in the uterus. UAE is effective regardless of the size, number, and distribution of fibroids. The procedure is capable of blocking off the blood supply to any and all fibroids present by way of inserting microscopic inert particles into the femoral artery, further embolizing the blood supply that nourishes the fibroid. Without a steady blood supply, the fibroids begin to dwindle and shrink. Therefore, embolization basically cures fibroids by starving them of the blood and nutrients necessary for growth. Recurrence of treated fibroids is very rare. Short and mid-term data have indicated that UFE is very effective with a very low rate of recurrence. Unlike myomectomies, UFE stops the problem at the source, ensuring that fibroid recurrence is virtually impossible. Additionally, the procedure has a overall success rate of 94%. Meaning that approximately 94% of all patients who had the procedure experienced relief from their symptoms and significant fibroid shrinkage. 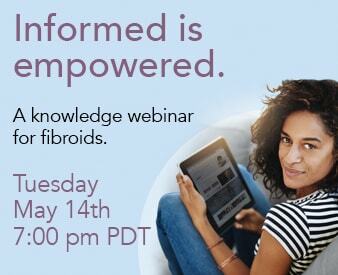 If you would like to learn more about fibroids and UFE or have any additional questions, please give the Fibroid Treatment Collective a call at 866-362-6463 and they will be more than happy to schedule you for a consultation.